Could a new “Manhattan Project” produce radically new energy sources? 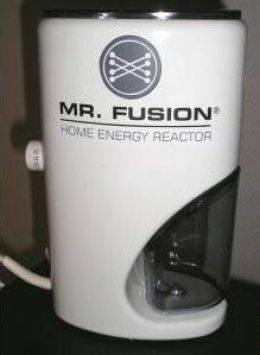 Summary: Can a new Manhattan Project produce a breakthrough in energy technology? “There is an idea that has been around for a long time, at least since the fall of 1973: All that stands between the United States and an abundant energy future is a lack of spending on research and development. It is as though the Knights Templar could find the Holy Grail, if only the Pope would commit just a few more resources to the hunt. A November 2007 post discussed the last and perhaps foundational source of American’s confidence that peak oil will prove manageable despite our feckless lack of preparedness: An urban legend to comfort America: crash programs will solve Peak Oil. This does not mean that we have adequately funded energy research. For example, the Navy (not DOE) funds development of the Polywell at only a few million dollars per year (see here; for more about the Polywell see here and here). But there are dozens of potential new energy sources, from algae-fuel to satellite-based solar power generators (see here for research about some of these). If we throw vast sums at every likely candidate, what breakthroughs might result? If we start soon, perhaps a substitute for oil can be developed and implemented in time. Perhaps, but probably not. Manhattan and Apollo were narrowly focused engineering projects, for which the underlying science was already well-developed — and the potential well-understood. With the possible exception of the Polywell, nothing else fits that description at this time. 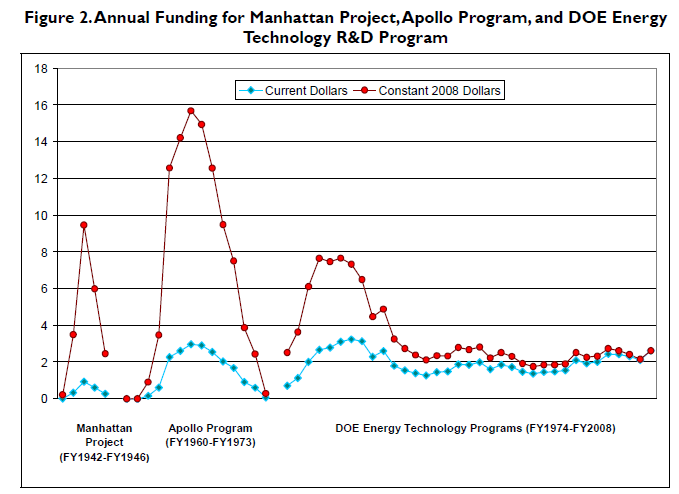 As usual, research by the Congressional Research Service provides an invaluable starting place: “The Manhattan Project, the Apollo Program, and Federal Energy Technology R&D Programs: A Comparative Analysis“, Deborah D. Stine, 30 June 2009. She compares the Manhattan and Apollo projects in both absolute terms (constant dollars) and relative to the US economy at that time, and compares those to our energy research since 1975. The Apollo Program was intense, large in dollars, and long. Apollo met its narrow goal, but was a near-total failure in larger terms (producing no space infrastructure or long-term national benefits). Energy research has been a low fraction of GDP per year, but massive in dollars and sustained for almost 2 generations. With few useful results relative to the cost. We’re one for three. Not a happy record. We’ll have to do better in the future if we’re to prosper — or even survive. Some policymakers have concluded that the energy challenges facing the United States are so critical that a concentrated investment in energy research and development (R&D) should be undertaken. The Manhattan project, which produced the atomic bomb, and the Apollo program, which landed American men on the moon, have been cited as examples of the success such R&D investments can yield. 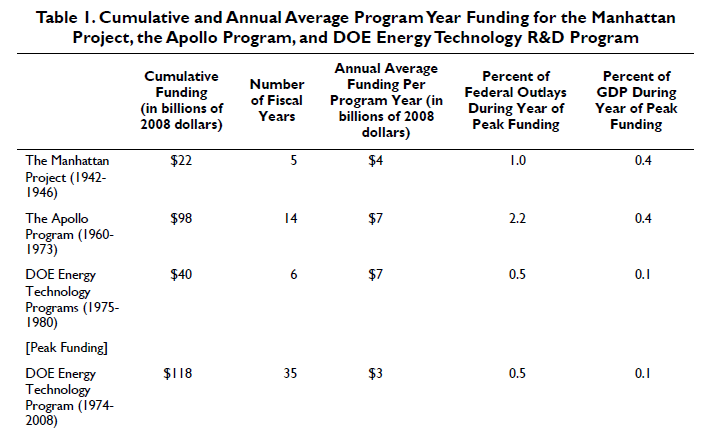 Investment in federal energy technology R&D programs of the 1970s, in response to two energy crises, have generally been viewed as less successful than the earlier two efforts. This report compares and contrasts the three initiatives. the use to which the technology would be put. Although the Manhattan project and the Apollo program may provide some useful analogies for funding, these differences may limit their utility regarding energy policy. Rather, energy technology R&D has been driven by at least three not always commensurate goals — resource and technological diversity, commercial viability, and environmental protection — which were not goals of the historical programs.